Many young people (77 per cent of Year 13 School students we surveyed) believe that those who apply for a university course through Clearing are only doing so because of missed grades. In reality, according to a YouthSight survey of students who actually came through Clearing, only 50 per cent are in Clearing for this reason. More than a third (38 per cent) of those Year 13s surveyed thought a lack of university offers was a reason for being in Clearing, when in reality it is only 12 per cent. Switching from another course: 13 per cent. Declining all university offers: 12 per cent. Not receiving any offers: 12 per cent. Switching from another university: 11 per cent. 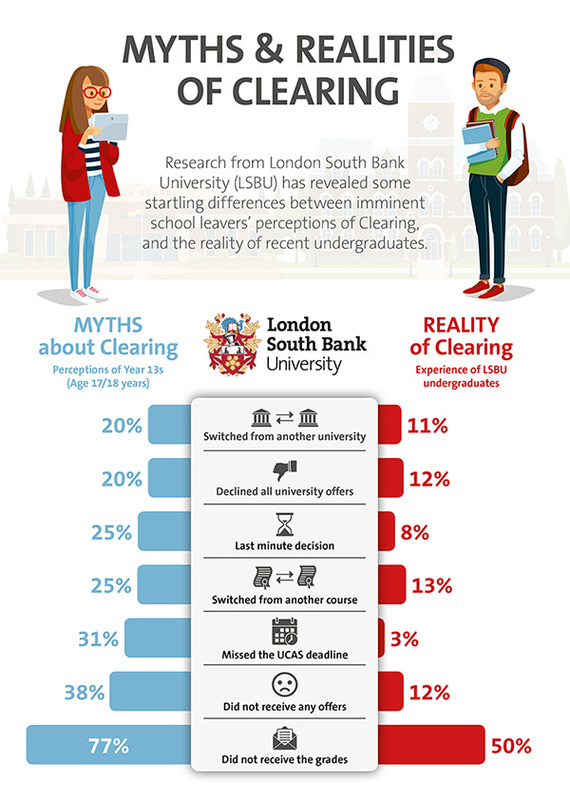 “Our research shows that Clearing is now about much more than missed grades and it’s high time that the tired and outdated myths so often associated with Clearing are laid to rest,” said Ian Mehrtens, Chief Operating Officer at LSBU. “Students now apply through Clearing for a whole raft of different reasons – many not even associated with exam results at all. “Analysis of our own student outcomes also confirms that applicants who apply through Clearing are not disadvantaged in their studies or career development, which completely undermines the tired and negative associations so often directed at Clearing. “With greater social mobility, diversity and numbers of people in Higher Education, routes to university inevitably become more varied. Many applicants are further removed from the UCAS timetable than perhaps A levels students who are guided through the applications process by their schools. Find out more about Clearing.